MGM Paso Finos LLC is located one mile south of downtown Newark, IL. We are located approximately thirty miles west of Joliet, IL. When traveling on Rt. 71 into Newark, turn south onto Fennel Road. We are a mile and a quarter down on the west side of the road. 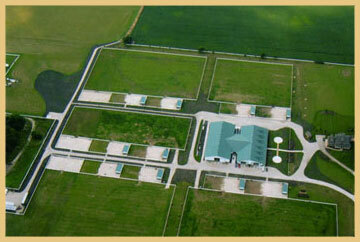 Look for the white four rail fencing and a large green and white barn. Long pants and sturdy shoes / boots with a ½-inch heel are recommended when riding. Open-toed / open healed shoes are prohibited. Riding helmets are required and must be provided by the rider. The stable’s policy for riding and classes during extreme weather conditions is posted in the stable. For more information, call (815) 695-1111.